They are litter-mates. 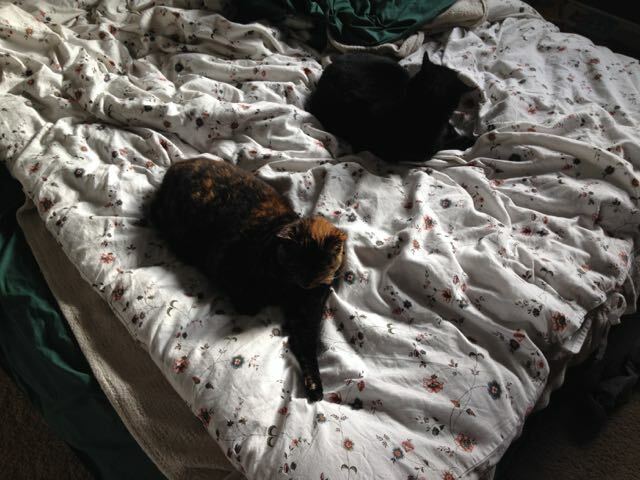 We got them in 2004 when they were wee kittens – Ramona the adventurous one, and Nicodemus the scaredy-cat. They used to wrestle hilariously and then fall asleep on top of each other. Then, when we moved to our house in 2007, there was A TERRIBLE DISASTER. They were displaced to this completely foreign new home, travelling in the same cat carrier and… one of them peed. (It had to be Nico.) So then we had to “rinse them off” – or, in their eyes, “give them a taste of the Special Hell” – as soon as they arrived. They were disoriented, furious, and humiliated. For the next two weeks, Ramona would not let Nico wander freely – she terrified him into the dark corners of the basement with her sheer imperiousness. In the many years since then, she has not thawed much. They are basically never nice to each other, and usually only tolerate being in the same room if there are treats. When I see them sharing a cozy space like this… I feel joy. By today’s standards, this is practically cuddling. That’s the same as my cats (except for the cuddly part as kittens). I have been finding that since K came along they are a little likely to share the same bed (but never, ever works they touch! ).